INDIANAPOLIS (March 27, 2019) – The Annex Group, LLC, a leading student and affordable housing developer, announces today the hiring of David Wesner as real estate development associate. In this role, Wesner is responsible for assisting in the real estate development process from inception to close by focusing on market research, underwriting, zoning and entitlements. His work will assist The Annex Group in increasing its financial and development capacity to ultimately heighten the quantitative and qualitative aspects of the company’s deals. Before joining The Annex Group, Wesner served as a financial analyst for an affordable housing developer and worked on underwriting as well as applying for and project managing tax credit projects. 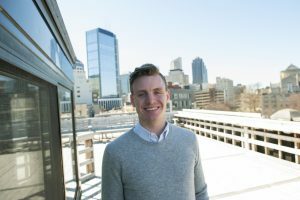 Wesner is a 2018 graduate of Indiana University Bloomington where he earned a Bachelor of Science in policy analysis and a minor in urban planning. He is currently pursuing a master’s degree in real estate development at the University of Indianapolis. Outside of work and school, Wesner is active with the Urban Land Institute, an organization that connects members of the real estate, planning, and construction industries, and its young leaders’ group. He also is a member of Edge Mentoring, a group that connects young professionals with each other as well as a more experienced mentor. The Annex Group is a leading student and affordable housing developer with a focus on providing innovative, amenitized housing in emerging markets throughout the United States. The Annex Group encompasses a vast portfolio of communities valued at more than $250 million. Serving as a catalyst for economic development, The Annex Group has overseen nearly $1 billion in commercial projects including redevelopment and ground-up construction. The Annex Group is proudly headquartered in Indianapolis, Indiana. To learn more about The Annex Group, visit www.theannexgrp.com or follow them on Facebook and LinkedIn.